I participated in the Stamping Fiskateer crop last weekend. I like crop weekends as not only do I get to craft with challenges, but I get needed cards done. 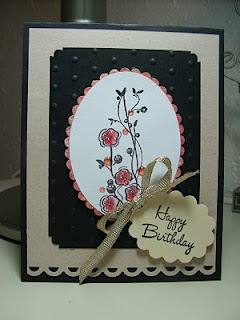 The challenge for the card above was simply to stamp on paper. The stamps are both Fiskars. The flower spray was from a set given to me but I had never used. I love it so you'll be seeing more of it. The border punch is Apron lace by Fiskars. I also found a great use for my scallop scissors. I always admire the scalloped shape I see on cards as it adds a beautiful lacy look to them. I imagine people either buy the layered shapes or have some kind of tool that makes them. Well I made my own and am glad it worked! I tried my hand at it and really like the finishing touch. The challenge for the card below was to use something orange. Same stamps and card design. 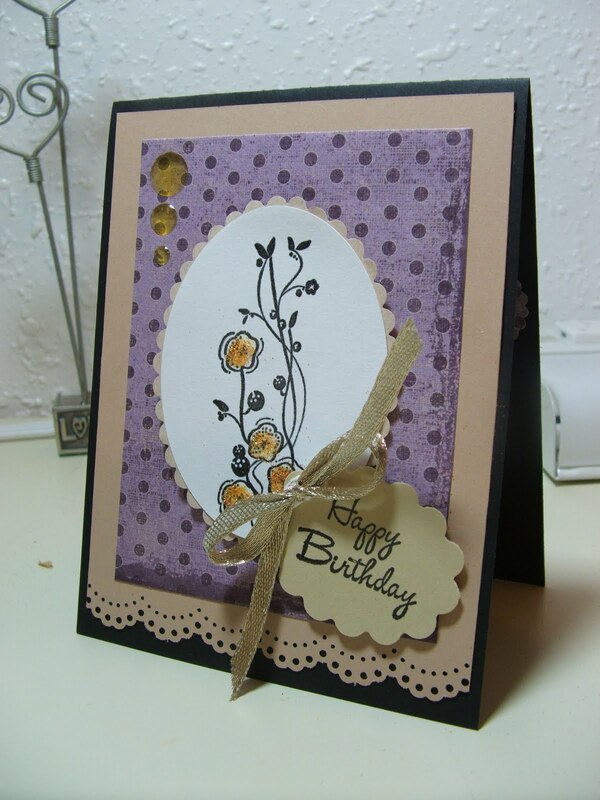 I used orange ink and art glitter for the flowers. The border punch is by Martha Stewart.